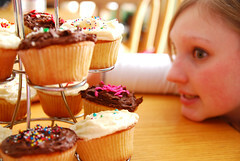 Cupcakes: Cure for a Headache? I had THEWORST headache yesterday. And I don't like to exaggerate things like this because I dislike people that make things a bigger deal than they need to be. I mean, honestly, it hurt so badly all I could do was lie in my bed from the time I got home from work until about 8 o'clock at night. After the Excedrin kicked in I could sleep, therefore when I woke up I was actually rested and didn't feel sleepy at all. So what did I do then? I stayed up until 1 in the morning making cupcakes of course. The first batch of cupcakes I made was a disaster. I don't know what I did wrong but they overflowed and caved in and the tops of them were crystallised with sugar. I don't know what it is but lately I've been having issues with cupcakes. Anyway I went to Lisa Yockelson's book ChocolateChocolate. I have never had a problem with any recipe by her. EVER. I remembered she had a recipe in the book for vanilla cupcakes called "The Cupcakes of My Childhood." How dreamy! And they really are. 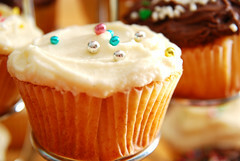 They taste like cupcakes from a mix, but they have none of the chemicals. Or cake flour, which I did not have. 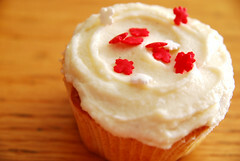 This might be my new go-to recipe for vanilla cupcakes. They come out perfectly every time. 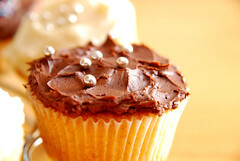 As for the frostings I used the recipes most recently posted on Cupcake Bakeshop's blog. Both came out deliciously, however my chocolate frosting is not a shiny as hers!! But it still tastes amazingly chocolate-y and fantastic. Preheat the oven to 350 degrees F and line 28 muffin cups with paper liners. Sift the flour, baking powder and salt together. In the bowl of an electric mixer, beat the butter until it's soft and creamy. Add the sugar 1/2 cup at a time until it is thoroughly incorporated. Add the eggs, one at a time and beat for about 30 seconds after each one is added. Add the egg yolks and vanilla extract. Then alternately add in the flour mixture and the milk, beginning and ending with the flour. Scoop about 1/4 of batter into each prepared cup. 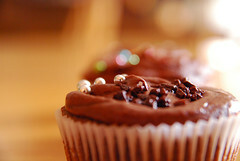 Bake the cupcakes in the preheated oven for about 20 minutes or until risen and slightly golden brown on top. When tested, a toothpick should come out clean. Turn out onto cooling racks and let cool completely before frosting. Beat the butter until soft, then add the powdered sugar and beat until incorporated. Add the vanilla and milk and beat until everything is completely combined and creamy. Melt the chocolate in the microwave in 20 second increments until it's nice and smooth. Set aside to cool. Combine the cocoa powder and boiling water to make a paste. Set this aside also. Cream the butter and powdered sugar until creamy. Add the melted chocolate and beat. Then add the cocoa paste and mix until smooth and shiny. Smooth both frostings on with a small icing spatula or spoon and indulge. 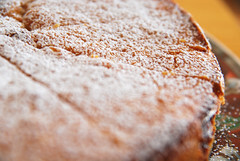 Variation on a Butter Cake. So it's Saturday night and I forgot that tomorrow is Sunday. I quickly search through a few cookbooks, come up with nothing exciting in particular unfortunately. (Laura I know you had your heart set on cinnamon crumb muffins, but I've been doing too many crumb things lately.) Then I see by my place at the dinner table the new issue of Gourmet Magazine! I flip to the last page to see what The Last Touch is (weird, I know but this is what I do when I get a new Gourmet in the mail), and I see this recipe called "Butter Cake." How perfect! It looks simple, easy and delicious. I decided since it was for brunch to add some raspberry jam in the middle, which was a nice touch, but I think this cake would be perfectly lovely just on its own. Preheat the oven to 375 degrees F. Butter a 9-inch round cake pan (I used a springform pan for easier serving). Sift together the flour, baking powder and salt. In the bowl of an electric mixer, cream the butter and sugar until light and fluffy. Add the egg and egg yolk and mix for another 30 seconds, until combined. Then add the zest and extract. Then alternately add in the flour mixture and the milk, beginning and ending with the flour. Pour this into the cake pan and bake for 35 to 40 minutes (obviously I divided the batter in half slightly at this point, spreading about 1/4 cup of raspberry jam in the middle) or until it's golden brown on top and a toothpick inserted in the center comes out clean. Let cool on wire rack completely and then dust with icing sugar, if desired. Cut into wedges and serve. 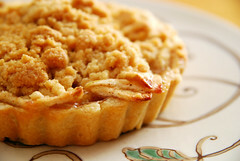 Dutch Apple Tarts or Using What's In The Freezer. This past Thanksgiving, for some reason I wish I could remember, I made extra pie/tart dough and so I rolled it out and put it into mini tart pans and froze them. They've been taking up a lot of room in there for 2, 3 months whatever now and it can be a pain to look for that bacon or pound of butter you KNOW is in there but you can't find it because of all the other crap involved. My mom found this recipe for Dutch apple crisp on a box of Wegmans pie dough (store-bought pie dough - gross) and it sounded delicious and a great way to get those tart shells out of the freezer. 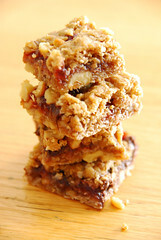 Plus anything with a crumble topping gets extra points from me. This original recipe is for 1 9-inch pie. Obviously I used 7 small ones. I don't think it really matters too much in the case of apple pie, since the apples tend to get soft and smoosh down a bit while they bake. I packed the apples pretty heavily into these, and it was perfect. 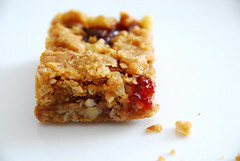 If I made these again I might double the crumble recipe and really pack that on top, but these were great with the amount of crumble it calls for. Here I'll give the recipe for the regular 9-inch pie, since I'm assuming most normal people don't randomly have some tart shells stocked in the back of the deep-freeze. Dutch Apple Crisp adapted from a Wegmans recipe on a box of pie dough. Prepare the pie crust, and line a 9-inch pan with it, then place this on a baking sheet and preheat the oven to 350 degrees F.
Blend the sugar, cornstarch, nutmeg, cinnamon and salt together in a small bowl. 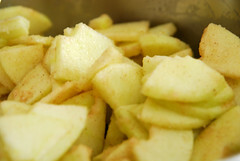 Then pour the dry sugar-spice mixture on top of the apples in a large bowl and toss them well to combine everything. Let this sit while you make the crumble topping. 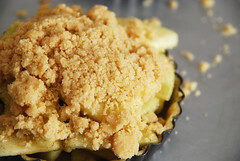 Then pour the apples into the pie crust, and top with the crumbles, packing lightly to make them not fall off while baking. Bake for about an hour, or until it gets golden brown on top and the apple mixture is nice and bubbly. Wait for it to cool off for a while and then dig in. I bet it'd be out of this world with some homemade vanilla ice cream - you know - the kind with real vanilla seeds in it? Yum. My favourite time to bake is at night. Usually the night before I have a day off. (The downside being that obviously this is not ideal time for photographs, so I usually wait until the next morning to do that.) It helps relax me, get me into a different kind of mood. Last night at dinner, my mom was going through old Kraft Family magazines looking for a macaroni salad recipe (hasn't been found yet) and she came across this recipe. "Hey Beth, this sounds like your kind of recipe!" I asked her to read me the name, and knew right away I'd make it, especially also because my dad adores anything with jam in it. Kraft Family magazine has two different versions as far as I can tell. They have the version for people who I'm assuming take their kids to soccer practice (or whatever) every day in the van and don't have time to make stuff so they just buy a bunch of Kraft products, throw them together and call it dinner. Then there is the version my family gets, the one that actually requires ingredients such as flour, baking powder, chocolate, things that you actually have to measure out in order to get the resulting recipe. Preheat the oven to 350 degrees F. Mix flour, brown sugar, baking powder and a pinch of salt together in a large bowl. 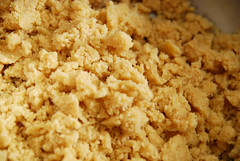 Cut in butter until mixture resembles large crumbs. Add oats, coconut, and pecans (or whatever nuts). Press half of this mixture into the bottom of a 9x13-inch baking pan and sprinkle with the chopped chocolate (or chocolate chips) and then spoon the jam over, evenly. Then sprinkle the remaining crumbles on top. 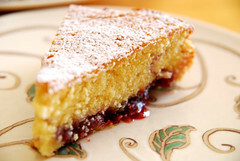 Bake for about 25 to 30 minutes, until the jam around the edges is bubbling lightly and the crumbs take on a slightly more golden colour. Cool completely on a wire rack, and cut into squares. My cousins Jenny and Fred are in town for a few days from Michigan. I guess I'd like to say I'm known as the family baker, so whenever we have get-togethers I like to make sure to bring something for everyone to enjoy after dinner, with coffee or just with good conversation. I woke up this morning, baked a batch of chocolate cupcakes, made some ganache while they were baking, then took the cupcakes out of the oven after they tested done. Then guess what happened? The cupcakes SANK. They CAVED IN. Needless to say I was pissed. Then I remembered this recipe I made about a year ago from Dorie Greenspan's most recent book that I loved. They don't sink, they rise a bit in the oven, but then when you take them out they go flat, PERFECT for my ganache frosting. Thank you Dorie Greenspaaaan. These cupcakes would be absolutely fine plain, but I adore sprinkles, dragees, anything shiny on top of my chocolate cupcakes. I just bought some pastel coloured ones at the store yesterday, so this was my opportunity to show them off. 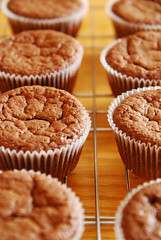 Chocolate-Chocolate Cupcakes From Dorie Greenspan's "Baking, From My Home to Yours"
Sift the flour, cocoa powder, baking powder, baking soda, and salt onto a piece of wax paper. Cream the butter and sugar together in a mixing bowl on medium until they are combined and smooth. Add the egg and the egg yolk, beating for 1 minute after each go in, and then add the vanilla. Add half the dry ingredients, then the buttermilk (or whatever), and then the other half of the dry ingredients until it's just combined. Then stir in the melted chocolate. Divide the batter among the cupcake cups (I love my ice cream scoop for this! 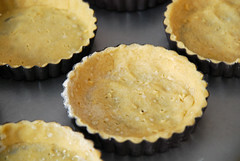 ), place in the oven and bake for about 22 to 25 minutes, until the tops are springy to the touch and a toothpick inserted in the middle comes out clean. I melt these all together in the microwave for about a minute, stir, and then melt in 10 second increments until it's all smooth and mixed together. I then placed this in the freezer for about 20 minutes, whisked it, and used it as a thicker consistency. 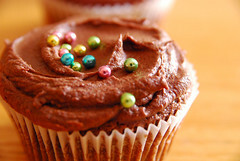 When the cupcakes are completely cool, use an icing spatula to swirl on the ganache, and while it's still soft, sprinkle on the toppings of your choice. 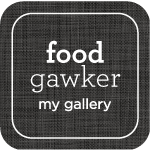 A quick introduction: I wanted a place to record what I bake or cook, the events and things that inspire them, and the photography I take as the end result or process of doing it. So this is it. Hope you enjoy. Every Sunday I don't work, I like to make my family brunch. I've done this for about 4 or 5 years now and I it's a nice tradition, and I hope to continue it until I move out. I grew up being dragged to Sunday morning mass (raised Catholic. not a Catholic now.) and sometimes the only thing that got me through was looking forward to my dad's omelettes, bacon, waffles, freshly brewed coffee, egg's Benedict. I've long since decided to stop going to church, but I have not stopped enjoying these things. 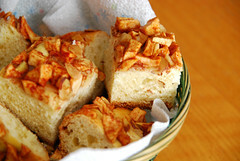 So to start this blog off the right way, a recipe I made for brunch this week from one of my all-time favourite cookbooks: apple kuchen. I like to think of this as a sweet focaccia almost. I had many apples to use up so I doubled this recipe and I changed the method a bit from what's in the cookbook itself, but it all ends up being about the same result anyway. If you're a fan of yeast breads, give this one a try. Recipe adapted/changed from Nigella Lawson's "How To Be A Domestic Goddess"
To make the dough, put 2 1/2 cups of flour in a mixing bowl with salt, sugar and yeast. 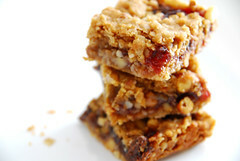 Beat the eggs and add the vanilla, (zest, nutmeg) cinnamon to the lukewarm milk and then add these to the flour mixture. Mix until a soft dough forms, probably adding about 3/4 to 1 cup more of flour, and then add in the butter and knead until it feels smoother and glutenous. Cover with a clean towel or greased plastic wrap and let rise until it's doubled in size, or in the refrigerator overnight. 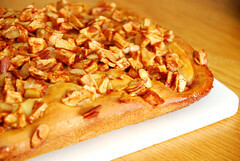 Punch down the dough and place it in a greased 9x13-inch baking pan. It won't stretch all the way to the edges at first, so let it rest and then try again in a few minutes until it's almost stretched to the whole pan. Then let it rise for about 15 to 20 minutes, until it has occupied all the edges. 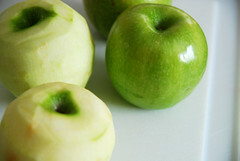 Preheat the oven to 400 degrees F. Peel, core and chop the apples. Stir together the egg and cream, and brush this over the dough. Then combine the sugars, spice(s) and almonds and toss with the chopped apples and then place these on top of the dough in the pan. Bake at 400 for 15 minutes, then turn the oven down to 350 and bake until it's nice and golden brown on top, about another 15 minutes or so. Then combine the icing sugar and water, and drizzle over. Enjoy with a nice cup of coffee or tea and read the Sunday paper until 1 o' clock in the afternoon.